4th Edition of the International Music Competitions “Walled Town”, will take place on 27th and 28th April 2019 in Cittadella (PD). Or visit www.concorsocittamurata.com for regulation and registration form. Farandola Associazione Culturale, with the purpose to promote the diffusion of the musical culture, facilitate the exchange and the comparison between musicians, to inspire and to encourage young people to the study of music and to highlight new talent, organizes the “Diapason d’oro – 5° International Young Musicians Competition”. It will take place from 3th to 5th May 2019 in Pordenone. The competition is open to young musicians of both sexes and of any nationality. Age limit: 26 years of age. Or visit www.farandola.eu > .for regulation and registration form. 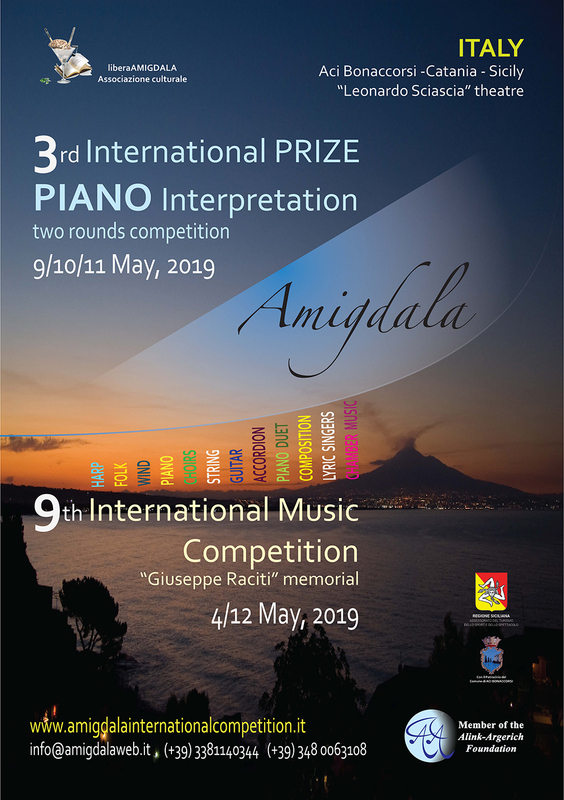 9th Edition of the Amigdala International Music Competition – “Giuseppe Raciti” memorial. Or visit www.amigdalainternationalcompetition.it for regulation and registration form. Organised by Musical Cultural Association “Mille e una Nota”, under the auspices of Teatro di San Carlo di Napoli, the competition aims to promote and divulge the musical culture. Will be held at the Teatro Comunale in Airola (BN). Or visit www.concorsocittadiairola.it > for regulation and registration form. International Festival of Harp – 10th edition. A unique learning, networking and performance opportunity in a city near you! Learn more and register now. The XI International Harp Competition “Marcel Tournier” is organized by the Conservatory of Music “Stanislao Giacomantonio”, Cosenza. The competition is open to harpists of all nationalities, and aims to encourage and support new, talented harpists.. Registration deadline: 10th September 2019. Or visit portale.conservatoriodicosenza.it for regulation and registration form. Hosted by Lyon & Healy Harps in the USA, Harptacular is a unique learning, networking and performance opportunity in Omaha, Nebraska. Learn more and register now.